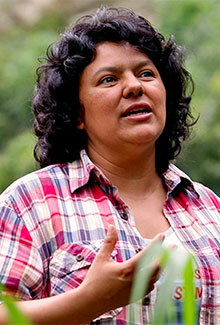 15 Trailblazing Female Environmentalists Who Have Changed the World. During April's Earth Month, we're celebrating the incredible women who are working to protect the environment and all of the creatures which share our planet. From groundbreaking primatologists to deep-sea explorers to determined activists, each of them has changed the way that we see the world — and our role in protecting it. Equally importantly, these women have shown all of us that we have an effect on the health of our plant: from the smallest decisions of our day-to-day lives to international policy — each of us can make a difference. Below we share the stories of 15 women and explore their contributions to making a greener and healthier world. And, if you'd like to learn more about any of the featured women or introduce them to children and teens, after each profile we've shared several reading recommendations for different age groups, as well as other resources that celebrate these remarkable women. For many books for children and teens about trailblazing women working to protect the planet, as well as on how kids can make a difference for the Earth, check out our special collection on the Top Children's Books on the Environment. To learn about more trailblazing women, don't miss the first post in our series about Mighty Girl Heroes: Those Who Dared To Discover: 16 Women Scientists You Should Know. Growing up on her parents’ farm in New York, Anna Botsford Comstock developed an appreciation for the wonder and beauty of the natural world. When she married, she turned her observant eye to illustrating the insects that she and her husband studied, drawing thousands of detailed pictures, first for her husband’s books and then for books they wrote together. After completing a degree in natural history in 1885, she started writing her own books, including The Handbook of Nature Study which is still considered a standard textbook today. She also broke new ground in the academic world, becoming the first female professor at Cornell University. Comstock is also famous for designing the first outdoor nature studies program for children, which took science out of the classroom and encouraged kids' love of the natural world. Her method became the model for nature studies programs around the world, helping to foster a new appreciation for the importance of conservation in the next generation. Rosalie Barrow Edge was such a ferocious advocate for the protection of wildlife that The New Yorker once called her “the only honest, unselfish, indomitable hellcat in the history of conservation.” After developing an interest in birdwatching in the 1920s, Edge was horrified to discover that 70,000 bald eagles were being slaughtered in the Alaskan Territory, but that existing conservation groups didn’t care because bald eagles weren’t rare at the time. 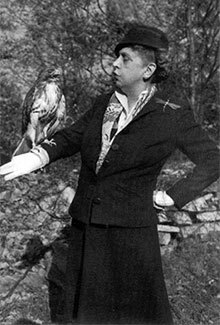 She founded the Emergency Conservation Committee, which was dedicated to protecting all species of birds and animals, common and rare alike, in 1929. She also ended decades of hawk and eagle shootings on a ridge in the Appalachian Mountains — by buying the property in 1934 and turning it into the world’s first refuge for birds of prey. 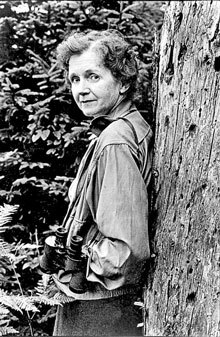 Her legacy also helped another pioneering environmentalist: in 1960, the Hawk Mountain Sanctuary provided scientific data to Rachel Carson, helping her link the decline in the juvenile raptor population to the unregulated spraying of DDT. When Marjory Stoneman Douglas moved to Miami as a young woman, the Everglades were considered a worthless swamp, but the budding journalist something different: a vibrant web of ecosystems, worthy of protection, that provided much of Florida's clean water. "There are no other Everglades in the world," she wrote in her 1947 book The Everglades: River of Grass, which has been compared to Rachel Carson's Silent Spring for its impact on popular opinion. In fact, without her ongoing activism, the Everglades would likely have died forever after large sections were either drained or contaminated. Her influence is best summed up by Florida Governor Lawton Chiles, who said, "[Marjory] was not just a pioneer of the environmental movement, she was a prophet, calling out to us to save the environment for our children and our grandchildren." 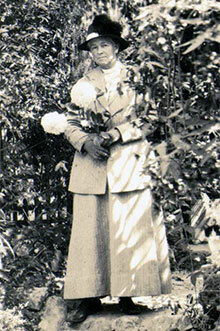 Margaret Thomas Murie is hailed by many, including the Sierra Club and the Wilderness Society, as the “Grandmother of the Conservation Movement.” The naturalist, author, and adventurer loved the outdoors and spent nearly 40 years studying wildlife with her husband, Olaus, on backcounty expeditions in Alaska and Wyoming. In 1956, she and her husband started a campaign to protect some of Alaska’s at risk natural territory. With the help of U.S. Supreme Court Justice William O. Douglas, they convinced President Dwight Eisenhower to set aside 8 million acres as the Arctic National Wildlife Refuge. Three decades later, she worked on the Alaska National Interest Lands Conservation Act, which doubled the size of the refuge. In between, she was instrumental in passing the Wilderness Act, which officially defined wilderness areas and created the National Wilderness Preservation System, which today protects over 100 million acres. For her work, Murie was honored with the Audubon Medal and the Presidential Medal of Freedom. When American marine biologist Rachel Carson published Silent Spring, she didn’t just call attention to the dangers of indiscriminate use of synthetic pesticides; she also helped launch the modern environmental movement. Carson began her career in the U.S. Fish and Wildlife Service, but after articles and books that she wrote about ocean life became extremely popular, she started writing about science full time. When Silent Spring was released in 1962, Carson stood strong against intense criticism from the chemical industry, despite a simultaneous battle against breast cancer that was outpacing her treatments. Even after Carson's death, her book fueled public interest in environmental and public health issues and, within a few years, the Nixon Administration formed the Environmental Protection Agency. "Silent Spring" is widely considered one of the twentieth century's most influential works of non-fiction. Dian Fossey broke new ground for female biologists in the field when she set out to study the mysterious mountain gorillas of Rwanda: the American primatologist succeeded in getting close to gorillas when no one else could by imitating their behavior. But as Fossey identified and cataloged many new aspects of gorilla behavior, she also saw the brutality of poaching first hand. After her favorite gorilla, Digit, was killed, she founded the Digit Fund to fund anti-poaching efforts. Fossey and her colleagues devoted significant attention to anti-poaching activities, including running poaching patrols, destroying poacher's traps, pressuring local authorities to enforce anti-poaching laws, and helping in the arrest of poachers. Tragically, Fossey was killed in her cabin in the Virunga Mountains of Rwanda in December 1985. Although the case has never been solved, it is widely believed that she was killed by a poacher in response to her aggressive anti-poaching efforts. Fossey left behind an amazing legacy – both one of greater knowledge about these previously poorly understood animals and one of inspiration which has motivated many people to join the fight to save the mountain gorillas. Her efforts continue today through the Dian Fossey Gorilla Fund. At a time when female scientists were often considered too fragile and emotional for fieldwork, Jane Goodall proved everyone wrong. 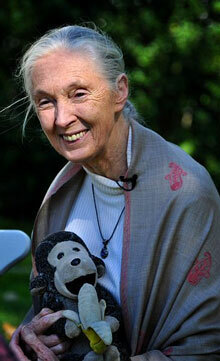 The British primatologist is considered the world's foremost expert on chimpanzees after her 55-year-long study on the wild chimpanzees in Gomber Stream National Park in Tanzania, but she's also a dedicated advocate and activist on behalf of animal welfare and conservation causes. Her discovery of tool manufacture and use among the chimps led her to challenge the idea that animals were distinctly different from humans, and argue instead that "we're not as different from the rest of the animal kingdom as we used to think." Today, the Jane Goodall Institute works with people around the world to develop a greater understanding of how we can help humanity while still protecting the natural world. This groundbreaking American marine biologist and oceanographer, who was Time Magazine's first Hero of the Planet in 1998, is known by her fans as the Sturgeon General! Sylvia Earle set a women's depth record for suit diving and has helped design research submarines, but she is most well known for her advocacy for protecting Earth's oceans. In 2009, she used money from a TED Prize to found Mission Blue, a non-profit dedicated to creating protected marine preserves around the world. Earle is also a best-selling author whose writing is increasing public awareness of the ecological importance of the ocean, which she calls "the blue heart of the planet". And to the delight of her fans both young and old, last year LEGO created a series of deep sea exploration building kits that are inspired by her work — and will inspire the next generation of ocean protectors. Wangari Maathai had a rare opportunity for a Kenyan woman in 1960: she was one of 300 Kenyan students selected for the Airlift Africa program, giving her the chance to attend university in the United States. After completing undergraduate and master’s degrees in biology, she returned to Kenya, where she had a new perspective on both the environmental damage in her country — and on the need for women’s rights. She founded the Green Belt Movement to tackle both, by teaching Kenyan women how to plant new trees in deforested areas and sustainably draw income from the land. Since then, the Movement has trained 30,000 women in trades to raise them out of poverty, and planted over 51 million trees. For her dedication to both environmental conservation and the advancement of women’s rights, Maathai received the Nobel Peace Prize in 2004 — the first African woman ever to receive the award. American activist Winona LaDuke learned early in her life about the challenges facing Native Americans: her father, an Objibwe man from Minnesota's White Earth Reservation, had a long history of activism relating to the loss of treaty lands. But within her tribe's traditional connection to the land, she also saw the potential for a new model of sustainable development and locally-based, environmentally conscious production of everything from food to energy. Her non-profit the White Earth Land Recovery Project has revived the cultivation of wild rice in Minnesota, and sells traditional foods under its label Native Harvest. She's also the cofounder of Honor the Earth, a Native-led organization that provides grants to Native-run environmental initiatives. "Power," she says, "is in the earth; it is in your relationship to the earth." By providing a model for that relationship, she hopes that other peoples, as well as Native American tribes, can see the value of sustainable, connected living. Like many girls in Gambia, Isatou Ceesay was forced to drop out of school at a young age — but that didn't mean she was oblivious to the environmental challenges around her. The colorful plastic bags that she used to admire were now gathering as trash all over her village, injuring livestock, helping mosquitoes breed, and strangling plants... and unlike the woven baskets her community was used to, they never decomposed. 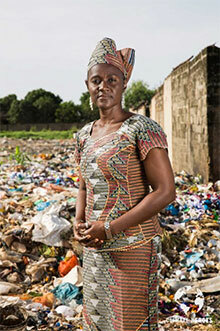 So in 1997, Ceesay founded the Njau Recycling and Income Generation Group. This revolutionary community recycling initiative turns waste into wealth: women collect the recyclable materials and bring them to a center where they separate out the plastics and upcycle them into bags, mats, purses, and more. Today, she is known as the "Queen of Recycling in The Gambia” and over 100 women gain income thanks to Ceesay's organization. You can learn more about her program or buy a bag at OnePlasticBag.com. For books for children about female environmentalists, visit our blog post, Women Saving The Planet: 20 Kids' Books About Female Environmentalists. For books about the environment to share with your Mighty Girl, check out our blog post Mighty Girls Go Green: 25 Girl-Empowering Books for Earth Month or our full selection of environment books. For films that featuring environment-conscious Mighty Girls and women, visit our blog post Mighty Girls Save the World: Environmental Films Starring Girls and Women. For more books about the natural world, visit our Animals & Nature section.